In Hasty Gourmet, The Takeout writers offer reliable recipes that are dinner-party worthy with only a handful of ingredients and a minimum of effort. I think the big difference between the cooking habits between my husband and myself can be summed up like this: I would have a delicious meal at a restaurant and think, “Wow, this is great, I have to come back here soon.” Brian would think, “Wow, this is great, I wonder how I can make this at home?” It’s an enthusiastic, adventurous cooking philosophy with just a little bit of hubris. Sometimes it pays off (chicken tikka masala) and sometimes it doesn’t (that time he attempted spring rolls). But what’s even more surprising is how many of his efforts actually succeed. Latest case in point: His famous (around our circle of friends, at least) Mongolian beef. It’s inspired by this restaurant called Great Seas not too far from our house in Chicago; another one of those places I’ve probably walked by bunches of times, whereas Brian actually takes the kids and goes inside. Still not sure what’s Mongolian about Mongolian beef—a region where the most common dish is cooked mutton—but we think even Genghis Khan himself could get behind this dinner. The small, unassuming Great Seas is famous for its lollipop-type chicken wings, featuring pictures of patrons with the number of wings they’ve downed as soon as you walk in the door (I swear some people reach a total of about a hundred). But even the regular menu is spectacular, with ginormous portions of Chinese standards like orange chicken (recipe coming soon, I promise) and the aforementioned Mongolian beef. Brian liked the Great Seas version so much (as did our son, who kept ignoring orange chicken in favor of his dad’s plate), that he set out to recreate it in our own tiny kitchen. His big takeaway: corn starch and baking soda as a tenderizing agent for the beef, so you don’t have to go all out and get expensive cuts—chuck roast (it’s got decent marbling) will do just fine. The sauce, enhanced by hoisin sauce—another item from the ethnic foods aisle at your local grocery—is salty sweet, cut by the onion and the garlic. 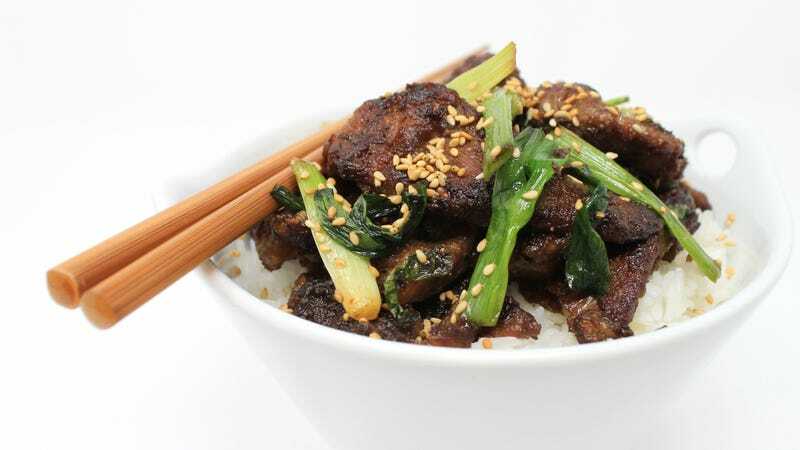 More traditional versions of this recipe add ginger as well; dark soy sauce lends sweeter notes to the saltier light soy. Best of all, this is another dinner that you can easily toss together on a weeknight, saving yourself a delivery fee while amazing your friends and relatives. The only downside is trying to avoid getting splattered by oil while you’re frying. Trim excess fat off of roast. Slice beef across the grain into 1/8" to 1/4" thick slices. In a bowl mix egg, baking soda, and corn starch. Add meat, stirring by hand and coating all sides with mixture. Mince garlic. Chop onion roots and tops clean. Slice lengthwise. Then slice in 1/2 inch lengths on the diagonal. Heat up your oil in a pan or wok. In a bowl, add sugar, then soy sauce and hoisin, then water. Whisk until fully incorporated. Once oil is up to temperature (around 350 degrees Fahrenheit), fry beef in batches for four minutes at a time, making sure that the pan isn’t overcrowded and that oil comes back up to temperature between batches. Drain beef. Pour oil out of pan. On high heat, heat up a couple of tablespoons of frying oil and saute garlic for about 30 seconds before re-adding beef. Then saute the beef, stirring constantly for about a minute making sure garlic gets everywhere. Whisk sauce one last time and add to beef in pan. Stir occasionally. As sauce thickens, beef will become coated with thickening sauce. When nearly all sauce is on the beef and not in the bottom of the pan, add spring onions, stirring constantly for about a minute or so.